It will woo customers, both cabbies and individuals from the Bolero, but the Scorpio, I dont think so. The Scorpio commands a huge brand value aided by its road presence, better looks, better air conditioning and a quieter & peppier engine. The TUV still looks like a people mover, which it is supposed to be. Mahindra now has taxi offerings across the Marazzo, Scorpio, Bolero, TUV Plus & the Xylo, now that's self-cannibalisation to the core..!! Cabbies I doubt, unless Mahindra plans to offer forward facing seats in 3rd row. The last row seats are useless and no one would hire. Ever since the launch of forward facing seats, cabbies have stopped buying cars with these CRAP seats. Cabbies won't touch anything that is uncomfortable. Primary reason why you don't see too many Bolero's/Scorpio's sporting yellow plates. When M&M launched T10 variant just 3 months after of me purchasing T8 variant, I felt devastated and cheated. I always wanted touchscreen infotainment in my vehicle, but settled for T8 as I liked the TUV300. Now I can connect with TUVians who purchased 84 bhp variant and RE Pegasus owners. I was under the impression that Xylo will be replaced by TUV 300 plus, but looks like its not the case. Also it looks like this plus variant has not set any sales chart on fire. I have hardly seen any Plus variant on road since it launch. I met a layman who admired my TUV 300 in the outskirts of Chennai once. He lives in a small village further outside of Chennai and he told me with pride that he's buying a TUV 300 Plus. He and I were taking a break at a highway restaurant, and he was back from booking it somewhere at a Mahindra showroom in Chennai. He was the typical earthy type of rural person you can meet outside of cities; and you should have seen the pride in his eyes and the admiration he had for my sub-4m TUV 300. Rural India is a different ballgame in many matters and this is one of them. He must have been a potential Bolero buyer who got an option to up his game with the TUV 300 Plus. What's so bad about that? As a current owner of TUV 300 100bhp, if I were to choose again I would still go with TUV 300. 1 - We use the 3rd row very less, I had this in mind when going for it. And for those short runs, the 3rd row seats seem adequate for medium height adults. I can't imagine asking 2 more persons to occupy the claustrophobic rear cabin. More importantly, the current 2nd row leg room in TUV300 is just enough for comfort, if TUV300 plus has lesser legroom , it's a very big negative. 2 - TUV300 100bhp is not at all that underpowered as teambhp official review indicates. I think, back when they reviewed TUV300 was 84bhp tune and later they increased it to 100bhp which is just sweet enough to cruise comfortably at 100kph. I never felt anything more to be safer on our highways. Infact, about 90 kph is my comfort zone for cruising. Torque of TUV300 also seems to be quite good enough for city errands, doesn't require much downshifting. I don't feel a need for larger engine for the tank. 3 - Compared to 2.2 ltr engine, 1.5 ltr engine of TUV300 offers better fuel economy and longer full tank range both of which are important factors, speaking of real world usage. 4 - Most of the time, lesser length means, its easier to fit into shorter parking places compared to 4+ m of body length of the PLUS variant. 5 - 215/75 R15 tyres of TUV300 has thicker sidewalls than 215/70 R16 tyres of TUV300 plus. I like beefier tyres on SUVs. Also, R15 tyres are cheaper to buy than R16 tyres. Neither looks all that great from the side. The regular model looks chopped off from the back. The Plus loses in proportions -- the rear overhang is much more than the front. The ideal proportions are somewhere in between the Plus and the Minus models. Thank you blackwasp & T-BHP - I think it is worth repeating to say that the new car reviews on T-BHP alone are worthy reasons to stick to the forum for one's daily fix of automotive nirvana! Straight from the hip, without unnecessary frills, down to earth and to the point. A signal lesson for all aspiring auto scribes in this burgeoning field of publications. I was waiting for just one review that would highlight the nature of the beast after the fitment of that 2.2L M-Hawk engine. The fact that it has transformed the on-road behavior & tractability of this larger (though lighter) TUV was music to the ears! Thanks again, blackwasp. Last edited by shashanka : 19th September 2018 at 11:58. Well to be honest, when they launched TUV 300 I never liked it and made fun of its boxy looks. Then later the design grew on me and kind of liked it. Now I am a proud owner of one myself. So we never know, it may appeal to few and it maybe hated by few. Intial news suggested that Xylo will be replaced by this Plus version, but looks like its not the case. Everytime I come across a TUV, I keep asking myself how a company that now owns Pininfarina(the one that designed my favorite Mitsubishi "Pajero/Shogun" Pinin) could design something like this. I hope the Pinin designers get to work on the next gen TUVs and make it look like its not owing its design from a kindergarten student's drawing book! Mahindra is working on a 7-seat version of the TUV300 Plus, suggests a new report from mint. The launch will take place in 2019. The original Mahindra TUV300, which hit the domestic market two years back, is a 7-seat model as standard. However, it has jump seats for the two additional passengers, not a conventional bench. The 9-seat Plus version that followed this June also gets jump seats. Citing an undisclosed source, the business publication says that “a seven-seater version of the TUV 300” is under development, but it’s safe to assume that it’s referring to a 7-seat TUV 300 Plus with a forward-facin third row. This setup will offer extra width for the storage compartment and other big items behind the seats. The third-row bench may feature head restraints for more comfort. The 7-seat Mahindra TUV300 Plus may come with the same 2.2-litre mHawk diesel engine as the 9-seat version. This engine produces 88 kW (120 hp) at 4,000 rpm and 280 Nm of torque at 1,800-2,800 rpm. It sends power to the rear wheels via a standard 6-speed manual transmission. The Mahindra TUV300 Plus 7-seater may have the same features as the 9-seater, but it may command a premium pricing for the higher seating comfort. The latter is available in three grades, with prices ranging starting at INR 9,59,001 (ex-showroom Delhi). My dear chap, don't get carried away! When M&M acquired Farina (the Pinin was a later addition - meaning "little", standing for Farina junior, Sergio - who passed away in 2012) the studio was on its knees, reduced to designing domestic furniture as per contemporary press reports. The fact that M&M have integrated the studio into its fold to the point where it can come up with something as edible as the Marazzo tell its own story. That possibly, the brain drain of outstanding designers may have been stemmed to an extent. One hopes that the Farina glory days return - sooner rather than later! But it would be unreasonable to expect M&M to come up with the likes of the bespoke Italian exotics, which were the Pininfarina hunting grounds earlier! Last edited by shashanka : 27th September 2018 at 14:33. Honestly, I wasn't expecting the TUV300 Plus to be a........For the top-spec TUV300 Plus, one has to shell out Rs. 13.34L. Paying almost 2 lakh rupees extra is not worth it for extra space in third row (at the cost of second row space) and 20 BHP gain in performance. *all prices are on road Delhi. Going through the above post I am tempted to say - to each his own. 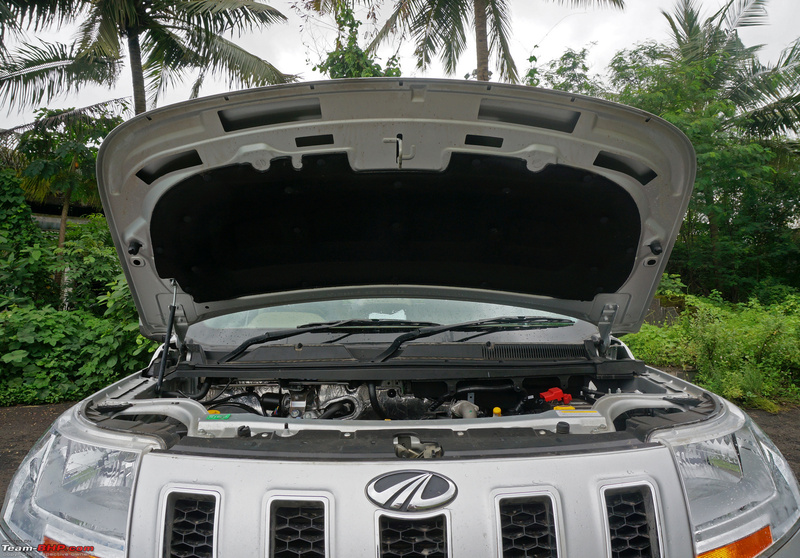 We had been eyeing the <4m TUV & found it satisfactory in most respects. What deterred us was its pathetic boot space with the rear seats up. Plus the number of reports of owners who found the rear wheelspin (even on near-normal roads) a major worry. We have been travelling with our pets (two active boxers) frequently on our road trips & had found our Scorpio to be a big help in this respect. And - miraculously! - M&M came up with the 300 plus. There may not be too many people with our particular requirements, but, to add the other plus-es of the 300 plus, was that 2.2L mHawk engine! A near irresistible package. Last edited by shashanka : 28th September 2018 at 13:11. Hi, I faintly remember reading about your pets somewhere on the forum. Going through the above post I am tempted to say - to each his own. We had been eyeing the <4m TUV & found it satisfactory in most respects. Fact is that more than a sub-4m TUV300, a new Scorpio would have been an ideal replacement for your current ride. I'm sure you wouldn't have settled for the sub-4m TUV300 given your kind of third-row usage. It would have been more like a good alternative due to lack of better options. Now that the Plus is here, it's a no-brainer for you to opt for that. My point was that it makes good sense as a Scorpio alternative. For those who would have otherwise settled for the TUV300 happily, the Plus variant (even with its extra power and space) doesn't seem attractive enough. We had been eyeing the <4m TUV & found it satisfactory in most respects...Plus the number of reports of owners who found the rear wheelspin (even on near-normal roads) a major worry. My parking lot is accessible after a 90 degree turn from a narrow street onto a ramp. I should probably be spinning my wheels daily getting in, but what I do is that i let native torque in 1st gear chug the vehicle in. On days when I've tried providing inputs, it has indeed spun furiously. My experience with the sub 4m TUV makes me think - was it ever such a big problem as it was made out to be? Offroad, I agree that the open differential and the weight distribution makes the sub-4m TUV a liability in certain situations. But in regular use, I don't think it is such a big liability. Absolutely, locusjag - my gut feeling, even earlier on, was that it was more a problem of driving habits & understanding the beast's temperament - of going with the flow, so to speak! You've nailed it, self_driven! There was a time when we were seriously considering the TUV300 - because of (like you said) a lack of better options & also because it fit our budget. After retirement one has to watch one's financial planning carefully ! The Plus variant came along at just the right time!